Take a look at some of the great materials we have in our bookstore, or that we think will bless you! The Mirror Bible is a paraphrase translation from the original Greek text of the Bible. The Mirror brings a fresh perspective to the table with every Greek word closely studied. Christ is the ultimate text and each page of The Mirror drips with grace as we discover our own identity restored in the very image of the invisible God. Katherine Dickerson discussed this pamphlet during her Friday morning session at our Prayer Summit, May 2018. 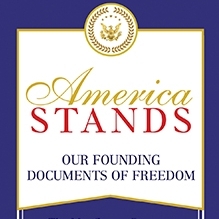 Kenneth Copeland Ministries has compiled an exceptional book for you in America Stands: Our Founding Documents of Freedom. You will be encouraged by the intent and content of each document and will see clearly the foundation on which America has been built! This Bible is a great tool for teaching little ones about God's works. Filled with beautiful illustrations and detailed text. Available in the Bookstore for purchase.